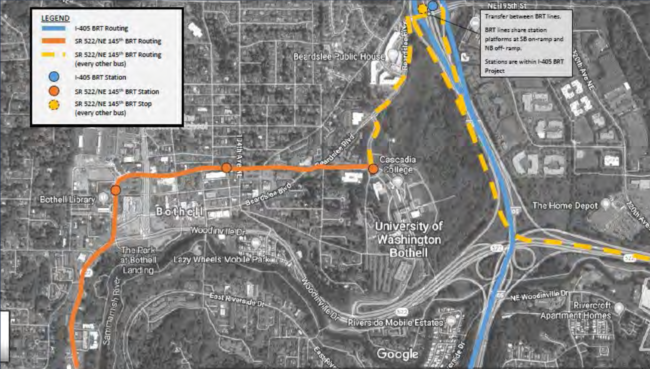 The junction of the I-405 and SR522 Stride BRT lines will be frustratingly close to the University of Washington – Bothell (UWB) and Cascadia College joint campus, close enough for a tempting diversion but too far to actually be convenient. Universities are good all-day transit demand generators, but too many campuses in the area were placed with only cars in mind. One of these is UWB, which lies just off an arterial and across a swamp from I-405. BRT, always constrained by where the major roadways are, can never be efficient for both through riders and those with business on campus. SR522 buses must take a detour to provide front-door service to campus, though a half-mile walk from Beardslee Blvd isn’t insurmountable for most. For I-405 buses, the nearest interchange is almost a full mile away. Although last-mile transfers are irritating, the two frequent lines could work together to deliver people from I-405. However, the baseline BRT plan sends only half of the SR522 buses on from UWB to Woodinville, meaning that the connection will typically involve 20 minute headways — totally unacceptable for this kind of transfer. Beyond the University trips, these two frequent lines are tantalizingly close to not actually connect. Worse yet, WSDOT’s plan for express toll lanes here is totally independent of the transit plan, and therefore provides no way for people to exit I-405 at 195th St while buses remain in the ETL. This amplifies the tradeoff between travel times and connectivity. Extending all SR522 buses to the 195th Freeway stop. This adds a few hundred riders per day beyond the other options. Abandoning the Beardslee routing to have both bus lines approach UWB from the South. I-405 through routers would sit through a 6 minute detour. Divert I-405 buses deep into central Bothell to provide a four-block transfer to the frequent SR522 buses, which would provide a connection to UWB. The I-405 Line suffers a 10-minute detour, but directly serves downtown Bothell. These are all “interim” solutions; Sound Transit staff recommend the first, with longer-term negotiations to make it work with the coming Express Toll Lanes. When evaluating these tradeoffs, it’s useful to remember the value judgments the ST board made at I-405 Stride’s birth. There were two planning concepts with roughly similar ridership estimates. The less expensive one mostly stayed on I-405, winning riders by providing a fast option for long-haul commuters. The more expensive one deviated from the highway to serve downtowns, therefore less attractive to those commuters but also enabling all-day, spontaneous transit trips between activity centers. The board opted to put the first line on the ballot. In light of that decision, downtown Bothell would be an odd exception to this pattern. Why serve Bothell while skipping Kirkland, Renton, and Tukwila? Sound Transit’s recommendation is the correct one. High frequency and a good bus pathway produce a good transfer. This matters not only for UWB students and staff, but everyone seeking to travel between points on these two corridors. This is what happens when there are only two alternatives studied, and the outcome is a political vote for one alternative package. I’d also observe that leaders were so jazzed about widening 145th, they didn’t really pay attention here. Until ST Board and management decides that there are more responsible ways to plan spending of huge amounts in our taxes and fees, we will be plagued by “what do we do now?” dilemmas like this. 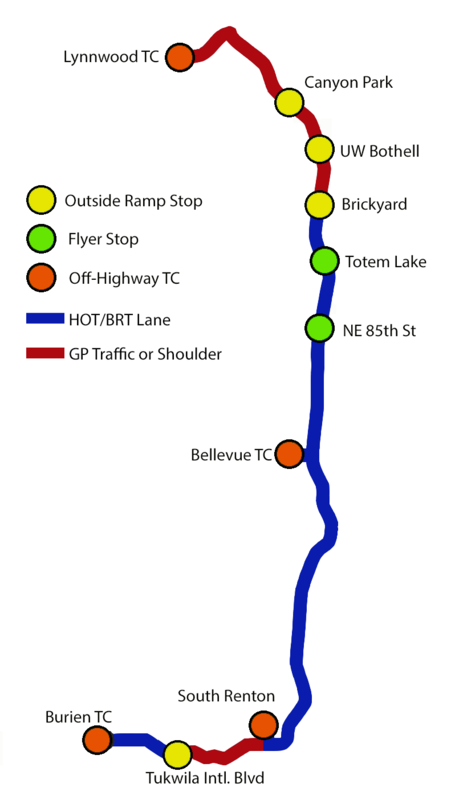 The 405 BRT is a bigger issue in Bothell than just the UWB connection. If you look at the Bothell Reporter article, there’s a number of other things that are going way beyond just removing Bothell downtown from the 405 routes. First, there’s the UWB and downtown Bothell issue. Bothell has been doing a lot of work on building up its downtown, but, to be fair, so has Kirkland. So having a stop at 195th to connect with the 522 is a compromise. Except that the next step is to (per the article) kill off both the 195th and Brickyard road stops since they won’t be on the new ETLs (I’m guessing Canyon Park will?) So now you’re losing all access for Bothell residents except at Canyon Park or (to the south) at the already overloaded Totem Lake P&R. And, to top it off, ST apparently wants to build a maintenance facility in Canyon Park near the P&R without any plans to incorporate TOD. Personally, as someone who lives in Bothell near Brickyard, it’s easy to understand why the city council is having some issues with ST right now. It’s transit oriented development, not maintenance base oriented development. This is the same issue as the Link bases at KDM and the Spring District, and potentially Lynnwood. You have to put bases somewhere if you want frequent bus/train service. Bothell has some points but they need to remember that not everybody on 405 Stride is going to Bothell. One option would be to simply defer the 405 Stride line since it can’t serve Bothell or Kirkland very well. But then that strands all the people who would ride it and are sick of the 535’s infrequency and span. For the maintenance base, I’m guessing it’s a bit more complicated than the Spring district. Canyon Park is supposed to be a regional growth center and I’m guessing there are commitments that Bothell has made for zoning, etc… If you put a maintenance base where you’re supposed to be densifying jobs and apartments, that’s going to make the council’s job that much harder. As for the 405 routing, at least the original proposal didn’t include a Bothell DT stop. It did include a stop at 195th and Brickyard. Remove those, and you’re leaving three stops between Lynnwood and Bellevue and effectively skipping any real ability to connect to Bothell DT. And if you look at it from a ridership point of view, 1/3 of the current 535 ridership originates/terminates between 195th St and Brickyard (and about 1/6 if you include the 532). Brickyard has almost the same ridership as Canyon Park and UW Bothell has more than Canyon Park. So why is ST dropping high ridership stations? What about something like a smaller version of the Coliseum–Oakland International Airport line? Doppelmayr makes an assortment of variants. The Birminham Airport version has 54 passenger trains operating every 120 seconds.Give the thing a push button like an elevator so it can shut down when there isn’t anyone to move. That would be awesome, but also overkill. The BART extension cost $500 million to build. I don’t think anyone is going to say that’s a good value here. If you’re going to spend a substantial amount of money, then it would be better to expand Beardslee to add transit lanes and add center ramps to 195th and Brickyard. Or add BAT lanes to the 522 east of Bothell to 405 and use the future ETL exit there for a quick side trip to Bothell and back. To be fair, the Oakland Airport Connector connects points 3 miles apart as well as has two tracks and four trains for the entire length. Any connection here would be much shorter and need only one track and one small train car. . In fact, there are many cable-pulled devices in place on a number of Lake Washington estates (of course not built to higher public use standards). Fair enough. From 195th/405 to DT Bothell is just about a mile along Beardslee. Practically speaking, the cheapest/easiest would be a streetcar with a dedicated lane and a single track except at stations. You might even be able pull this off without widening most of Beardslee if you took away the parking. If you look at, say, the First Hill streetcar, you could probably do it for $70ish million. That’s still a lot of money, and if Bothell gets this, then Kirkland should as well. Wouldn’t the cheapest and easiest option be to run a frequent bus along Beardslee? No idea, though I was thinking in terms of train service only. But, if the goal is to have transit ROW, then for buses you’d probably have to have two lanes. For streetcars, you could probably get away with a single lane. I don’t know how much adding tracks and trains would compare to doubling the new ROW and acquiring buses. The problem with a streetcar is you wind up having to do vehicle maintenance, have a spare on hand, etc. Cable pulled people movers wind up being more like elevators. The Birmingham Airport connection, between the city airport and the city train station, seems a pretty good solution. It cost £11 million to build, which is about the same as several streetcars, with no line built for them. You took the thought right off my keyboard, Glenn. I was just about to link the Oakland setup myself. The need, along with the college and the community, is only going to grow as years go by. – The campus design only modestly assumes enrollment to 10K from just under 8K. – The transit plan suggests only an enhanced transit stop on Beardslee. – The text just commits participating in STRide planning for 405 and 522 projects, but doesn’t promote any strategic designs related to the stops or stations. I don’t see UW Bothell promoting a revised vision that’s better for transit or more of a regional attraction. I can understand why ST doesn’t want to force a change its status quo campus planning. The only way that a better design for transit connectivity can evolve is for UW Bothell to take the initiative to suggest how it could be radically better and — outside of a student protest action — I don’t see that happening. Or run a campus shuttle to the 405 Stride station to supplement 522 Stride. And the 372 will be there too, right? It could also have a short extension. ST-3 is supposed to last 25 years. Think how many of ST-4’s and Bothell’s voters have yet to be born. A lot of this evening’s Cascadia students will be minding their own Cascadians’ kids while their folks are at college. Passengers who are students become faculty and administrators, and some run for elective office. Suggestion for channeling some discontent to a case-hardened political cutting edge. Put it on social media that when you turn 18, you can run a legislator whose decisions impaired your education- including transportation to it- out of Olympia before you get accepted to Cascadia. Because individually and as a community, we very often DO learn lessons that let us solve the problems we’ve been left. Railcar’s easier when you’ve got wheeled luggage- lesson usually takes about two minutes. Lot’s of places that were designed with cars in mind get diversions … Bellevue College, Microsoft, etc. The F Line diverts to Tukwila Station. The B Line diverts to the Overlake P&R. UW Bothell’s mini transit center serves more routes than the Tukwila and Overlake combined. None of those diversions are HCT. Microsoft won’t get a “diversion” for Link. But that’s because Link runs in its own guideway and isn’t limited by the roads. If Stride had its own guideway, then diverting wouldn’t be a question. Doesn’t Pierce Transit proposed HCT divert to Tacoma Dome Station? Yes it does in theory, Sam. I’ve long felt to build the 10 mile long Tacoma Done extension and not to go 1/3 of a mile to intersect with the Pierce HCT route as well as be within reasonable walking distance of UWT was short-sighted. It’s one of those ST3 decisions that didn’t get thought through well because each project is viewed on its own merits rather than part of a system. Ah, it does divert to Tacoma Dome. Though I think I’d argue Tacoma Dome is a major destination, not a diversion. Question: should STRIDE really qualify as HCT? Does ST Route 512 also qualify? I would argue no on both counts–they’re still essentially express busses. I’ll duck for cover now. The car centric nature of a destination has nothing to do with it. It really comes down to whether the cost of the diversion is worth it. 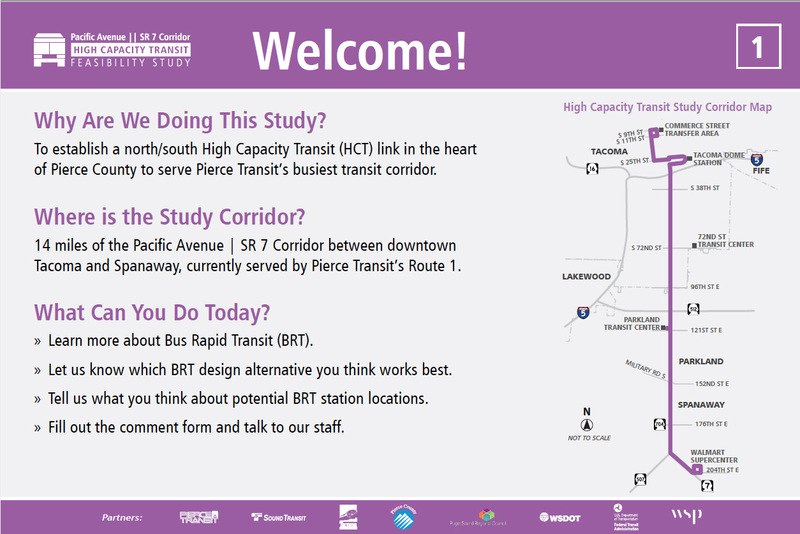 In this case, it is worth the diversion for the 522 BRT, but not for I-405 BRT. With the 522 line, there is very little ridership to Woodinville (which is why they only plan on running buses there half the time). UW Bothell is a bigger destination. So that means that while some through riders (folks trying to get from Woodinville to Kenmore) experience a delay, more riders benefit (e. g. folks from Seattle headed to UW Bothell). In the case of I-405 BRT, it is the opposite. Lynnwood and Canyon Park trips to Bellevue trips represent the bulk of the ridership for the north end of that line. Those riders outnumber those headed to UW Bothell. Furthermore, those riders headed to UW Bothell can transfer. The only question, really, is how often that transfer occurs. Even a twenty minute transfer — the initial plan — is really not that bad. But if both buses ran every ten minutes, it would represent a big improvement over the current line, and be a good balance between the needs of the through riders versus those headed to UW/Bothell. ST uses two service patterns today. why not in ST3? I-405 is a major barrier. I think the author makes a great point about the original value judgement that went into the ST3 preferred alignment. But what if the 10 minute divergence to Bothell was coupled with peak-only STX Express service from Lynnwood to Bellevue that runs in the ELT lanes (i.e. skips Bothell & brickyard)? End to end travelers on 405 get STX, and trips to intermediate destinations get a great transfer in Bothell. At peak, commuters prefer the fastest route. But off peak, the value of BRT becomes its high frequency and long span of service. For example, if I’m heading home from Bellevue back to Snohomish, I know that if I leave work before say 6pm, I can catch a fast STX, but after 6pm I’m taking a slower BRT but I know that bus is departing every 12 minutes until 11pm. Build a campus that allows for the preservation and restoration of a wetland, but also requires a car to get there. Note the campus seems way more concerned about its future parking facilities than transit connections. This whole line is a repeat of the same problem at nearly every stop. The built environment makes serving people without cars difficult by design. Yeah it’s that same “environmentalism” attitude which seeks to protect Seattle’s tree canopy by having single-family zoning with setbacks. The UW satellite campuses were planned in the late 80s, and were sort of consistent with the regional growth expectations of the time and the assumption that in the future Everyone Will Drive Everywhere, even more than they did then. Transit accessibility was most assuredly way down on the list of considerations. Except that UW Tacoma is an urban campus. The issue was that Washington had fallen to last in the country for the number of college slts per capita so it really needed to add more campuses and upgrade 2-year colleges to 4-year colleges. The Bothell/Snohomish area has some 700K people and needed a campus, but it’s a basket case in terms of walkability and they didn’t try to fix it with one university. Keep in mind that Snohomish riders getting on 405 STRide at Lynnwood could just as easily get on Link and get off at 145th to transfer to 523 STRide. It seems that 405 access to and from the south is the major deficiency here. My suggestion of overlaying a Lynwood-Bellevue STX route at peak would also solve this overcrowding problem. If I’m in Lynnwood trying to get to Bellevue, I’d just stay on Link rather than do a Link-BRT-BRT 3-seat ride. Link-522 BRT only makes sense if my destination is Bothell itself. Note that 405 BRT also plays an important role connecting the Green(?) SWIFT line at Canyon Park to the rest of the network. Wouldn’t simply extending the Green Swift line to Bothell (the original concept) and terminate at UWB make some sense? Or just extending the Green Swift line onto 405 between Canyon Oark and the 405 UWB exit and ending at UWB? With Swift Blue line proposed to end at 185th/ Shoreline North Link station, the county line doesn’t appear to limit where Swift can go. It would be worse than that for most of the potential Lynnwood commuters. Except for those lucky enough to live within the Lynnwood Link station walkshed, everyone else would need to catch a CT local route to start with (or be lucky enough to have someone be able to drop them off at the station). The Swift Green Bothell extension is just waiting for funding. AJ has the right idea. During rush hour, it makes the most sense to have a very fast trunk and branch system that only serves flyer stops and end destinations along the freeway. For example, a bus could start at Edmonds CC, go along 196th to Lynnwood TC, get on the freeway, stop at Totem Lake and end at Bellevue. Another bus would go from Woodinville to 405, get on the freeway, stop at Totem Lake and then end at Bellevue. A third bus could go from Bothell through UW Bothell and on to Bellevue. Any one of those buses could continue onto Renton or Burien. The important thing is that those express buses don’t waste their time getting to and from the HOT/HOV lanes. That is very difficult with the current I-405 BRT plans (because so many of the stops are outside ramp stops — https://s3.amazonaws.com/stb-wp/wp-content/uploads/2016/04/23220832/I405_BRT_STB2.png). It is difficult enough that ST has basically said that the “BRT” line won’t even use the HOT/HOV lanes (it is too much bother). That means that rush hour riders from Lynnwood (who probably represent the bulk of ridership) will have a slow slog to downtown Bellevue. I really don’t think we have to worry about overcrowding. I think it is quite possible that other agencies will simply offer express buses that will be faster and more popular (my guess is Community Transit will send express buses to Bellevue about the same time they stop sending express buses to Seattle). During rush hour, the 405 BRT then becomes a way to serve less popular destinations or a backup for riders who miss their express. Outside of rush hour, there are a number of different options. As AJ suggested elsewhere, one option would be to deviate further (which is the focus of this article). That means a slower ride for someone trying to get from Lynnwood to Bellevue, but a faster connection from Lynnwood or Bellevue to UW Bothell. Outside of rush hour, the bus moves faster, which means the deviation slows people down, but you might make up for it with fewer transfers (deviating further when buses are less frequent). Another option would be to continue with the trunk and branch express buses, but run them a lot less frequently. A third option is to run a single line, and force transfers. That appears to be the approach that is taking. It may mean time consuming transfers, but ST has committed to having at least one bus (the I-405 BRT) run frequently. Personally I think that approach is the right one. If you are already committed to frequent all day service, it doesn’t make sense to water it down with really slow travel times. The 41 goes from Northgate to downtown directly — it doesn’t stop at the U-District, even though the U-District is a major destination (much bigger than UW Bothell). It is up to other buses to make that connection (directly or by connecting to the ST bus). But generally I agree with all your points. While the core BRT line probably needs to terminate at the TC for operational reasons, I like the idea of the STX (or CT) routes having a tail in Snohomish to collect additional riders … that’s a good way to ‘extend the walkshed’ of the BRT stations. I doubt ST will change their I-405 plans significantly or add new runs. It is one thing to detour a bit, or extend a line (or just run the extension more often). It is another thing to change the nature of the service. I think it is highly likely that Community Transit will add a few express buses to Bellevue. The time savings for riders are significant, especially when they connect into the neighborhoods (saving riders a transfer). Even today there are plenty of direct buses to downtown from Lynnwood, despite excellent, very direct express buses from ST. As with those buses, I would imagine they would run peak only. I expect all those Seattle buses to be truncated in Lynnwood, and some portion of that savings going into express buses to Bellevue. It wouldn’t surprise me if Metro offers one seat rides from Bothell to Bellevue, similar to the existing 535, but without anything north of UW Bothell. Like the other express buses, it would likely be peak only (serving the Bothell Park and Ride). RossB: at one time, Route 41 did stop at NE 45th Street in the reverse peak direction, as Route 512 does today. You mean Bothell isn’t getting their own $300,000,000 BRT stop? I the big picture I think it’s time to abandon Brickyard and concentrate on Beardsley. It’s not just the UW/Cascadia campus but the business park on the east side of 405 is already a major employment center and growing. Put the money into a dedicated flyer stop here ala Totem Lake and then rely on building up an east/west network of buses that serve Bothell, “Beardsley, Woodinville. There really is no major development that’s going to happen around Brickyard and if people with cars have to drive to a different P&R, well so be it. Sell that property, put in a standard eastside (un)frequent bus connection between Kingsgate/Totem Lake and Juanita/Kirkland and call it a day. What other P&R is there? Totem Lake is full and even when they upgrade it, it’ll likely fill up quickly. Canyon Park is way north. 85th and 195th won’t/don’t have P&R’s. Brickyard serves basically everyone south of canyon park as well as chunks of kenmore. Take it away, and all those people will be driving to work instead of taking the bus. The 238/236/255 already serve the area – it takes 20-30 minutes to get to Totem Lake on them. Also don’t forget that one of the classroom buildings (UWBB) (about .5 mi from the rest of campus at Beardslee &110th) is not served by the 522 and 535 busses (which go right by there; the metro and CT busses that go by UWBB stop there). There is car parking at UWBB. Good point. It is a sprawling campus, and isn’t necessarily served that well right now. That is why I think it is best to go with the original plan, or the “ST3 Modified” plan (which simply extends all the buses to I-405/195th). The bus stop at 185th and 110th is a bit farther away from the main campus building, but it is five minutes away from that building (and right next door to Cascadia, etc.). Moving that stop to the other side of campus really doesn’t get you that much. @RossB The bus stop I was talking about is the one at Beardslee and 110th. not 180th and 110th. Cascadia college is not right next to UWBB. I just measured the distance in Google Earth from the I-405/195th freeway station to the existing UW Bothell bus stop currently served by the 522, and 1 mile is a bit of an exaggeration. From the northbound freeway station, it’s about 2/3 mile. From the southbound freeway station, it’s about 1/10th mile less. Within a 15 minute or so walk from the bus stop, you’re already in the middle of campus. The walk is not particularly steep and has a good sidewalk throughout. Which means the transfer option is really just a bonus, so when the 522 bus happens to be coming soon, you can save a few minutes by not having to walk. I think the Sound Transit proposed solution of sending every 522 bus at least to 405/195th is reasonable. Detouring all the thru-riders to serve the UW Bothell front door is not reasonable. The detour option replaces a (worst-case) 15-minute walk with a 5-minute bus ride, a savings of 10 minutes (and, if the connecting bus is coming soon and you don’t have to walk, the difference is less than that). But it costs a full 10 minutes for everybody else, so unless half the people on the bus are going to UW Bothell (which I doubt is the case), it’s a net loss. I agree. It doesn’t make sense to deviate the I-405 BRT line. It deviates too much as it is (at least during rush hour). The northern part of the line will be driven by Lynnwood to Bellevue riders. It doesn’t make sense for those riders to spend a lot of extra time going over to Bothell. For the 522 BRT, it is a different dynamic. Downtown Bothell and UW Bothell is the strongest tail available. Through riders from Woodinville get delayed, but they are likely outnumbered by Bothell riders and riders trying to get from Woodinville to Bothell. The only question is where to end, and how often. The Cascadia stop (at 185th and 110th) is a fine stop — you are essentially on the campus. Curving back down and around (the South Campus Option on page 13) isn’t worth it to me. Just in isolation (i. e. riders who are exclusively on the 522 corridor) it isn’t worth it. If I’m on the bus headed east on 185th, I just want the bus to keep going, and drop me off at the north end of campus, even if I have to walk five minutes to the other end. So that leaves merely the question as to how often it goes to I-405/195th. Ideally it is all the time. Given the relatively short distance, it is a bit puzzling why that wasn’t the default. I see two possible issues. The first is additional traffic. But traffic issues are a problem if they send any buses there (and on to Woodinville). If a westbound bus is delayed a few minutes just getting onto Bothell Way, then it is a problem whether that happens with every bus, or every other bus. From what I can tell, the bigger issue is how to turn the bus around. I don’t see an easy way to do that, which is why they probably punted on the issue in the first place. My guess is they’ve figured it out, which is why they are considering terminating all the buses there. It really doesn’t seem like much of a dilemma. Just go with the “ST Modified” approach (of extending all the 522 buses to I-405/195th). No one loses, and many win. Furthermore, if money gets tight or ridership is very low to I-405/195th, then it is very easy to scale back, and go with the original approach (terminating half the 522 buses at UW Bothell). How the bus would turn around at I-405/195th is an interesting question, without an obvious answer. The cheapest option I see is to just send the bus on partway to Woodinville, serving the freeway stations where 131st. Ave. crosses SR-522. This is just a couple more miles of freeway, so almost no additional running time. At the eastbound freeway station, the bus driver could pull over for the layover, then, the bus can use the traffic lights to turn around, serve the westbound freeway station, and head back to campus. The only tricky question is where does the bus driver get to use the restroom. The only restroom close enough to allow the bus driver to get in and out during a 15-minute layover is a Dairy Queen, but it doesn’t open until 10:30 AM, a porta-potty in the parking lot would likely be needed. Still seems like a solvable problem, though. In my ideal wide-eyed fantasy future, there’s a bus-only ramp flying over 522 from 405 south directly into the campus, with buses using an as-transit-friendly-as-possible Beardslee to get back to 405. I don’t know how much that would cost or what environmental impacts it might have though. Great article! https://en.wikipedia.org/wiki/Seattle – this page is a mess. the ST3 ballot measure seems to have promised very costly connections. it is difficult to reach pedestrians with transit that runs in the center of a freeway envelope. adage: freeways are to pedestrians as dams are to fish. At NE 85th Street, ST3 proposes to throw a large pile of money at the issue. At NE 128th Street, Sound Move provided an overcrossing and center access ramps. At Bothell, it looked like lines on the map. the connection is not trivial. the two options entail 10 to 15 minutes of deviation for through riders. the current answer is two service patterns, one serving Bothell; one skipping Bothell.